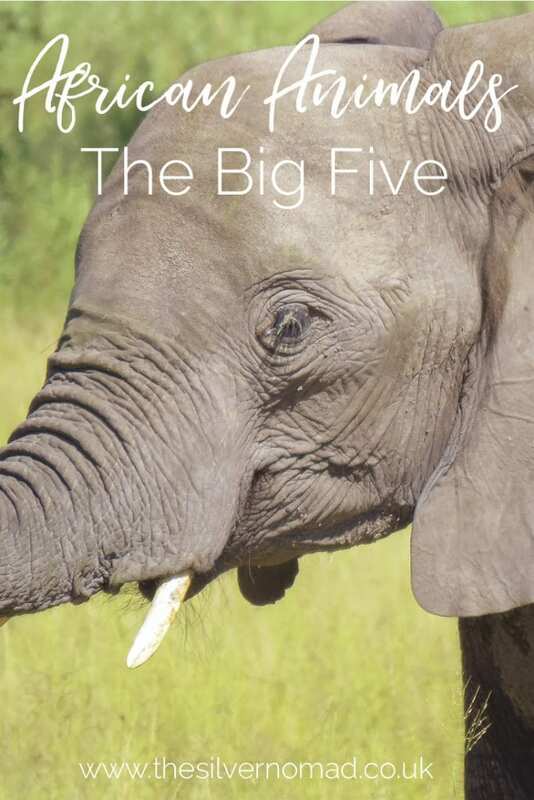 Most people have heard of The Big Five when it comes to the animal kingdom, but have you heard of the other Fives, the Ugly, the Little, the Shy and the Impossible Fives? 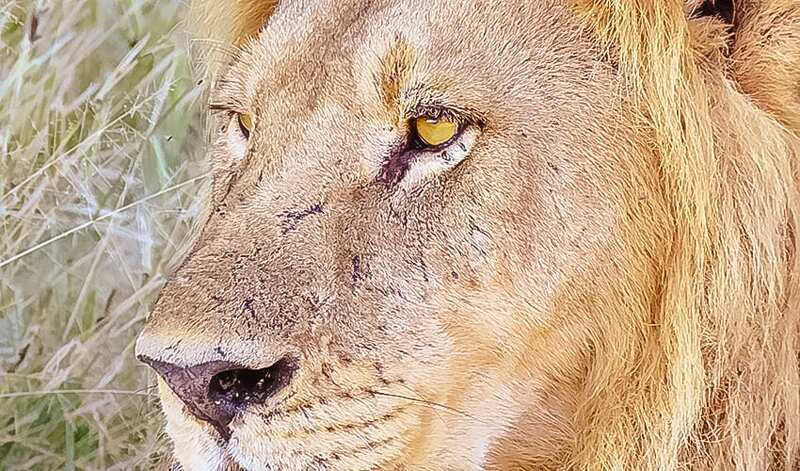 With time, patience and a dollop of luck you can get to see many of them on a trip to Africa, we managed to see a few on our recent safari to Botswana. The lions, rhinos, leopards, elephants and water buffalo that make up the Big Five are some of the larger animals that are found in Africa. So why not include the hippo, zebra or giraffe? Well, sadly the Big Five are named so because they were, and in a lot of case still are, the most sought-after trophy kills for a hunter. 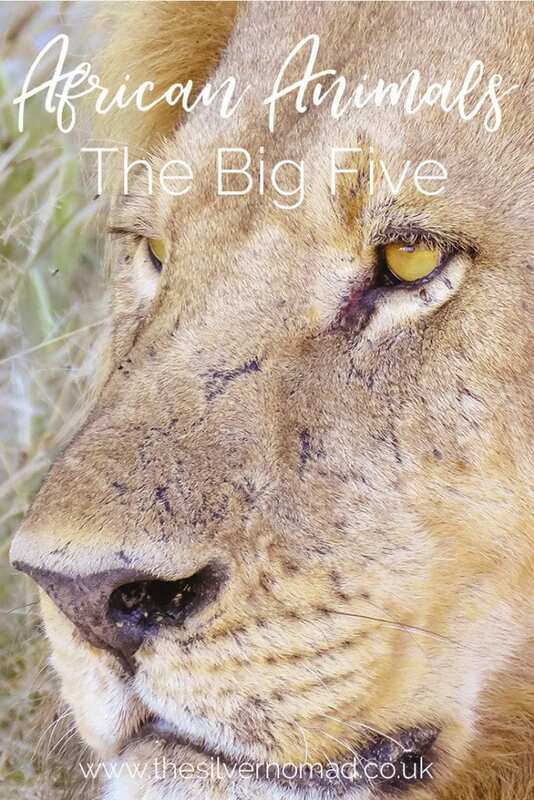 The Big Five become more dangerous if they have been injured or are cornered and therefore a bigger catch. As a lure to tourists, tour guides have cottoned on and now sell Big Five Tours to tourists so they can shoot with cameras, not guns. Like all animals in the wild, some are easier to see than others. The rhinos, in particular, are difficult to spot though now that the Botswana Rhino Reintroduction Project have reintroduced both black and white rhinos your chances have improved greatly. 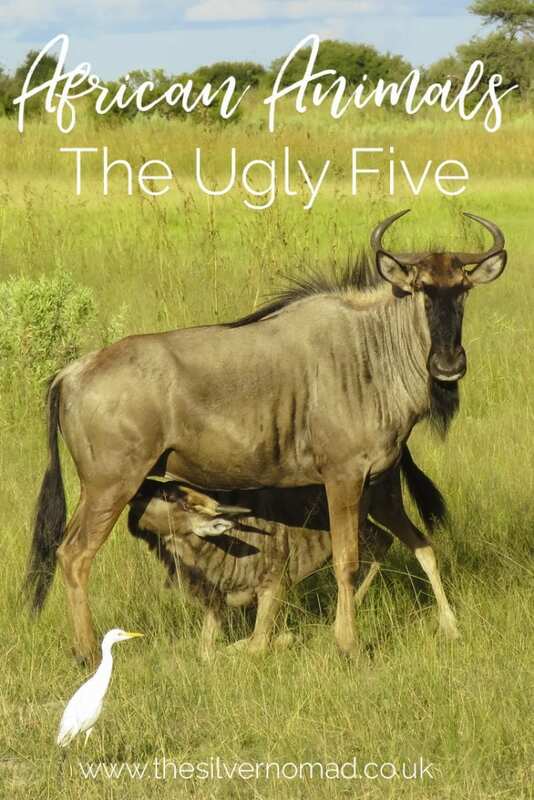 Oh the poor Ugly Five, the vulture, hyena, wildebeest, warthog and Marabou stork. They may have been at the back of the queue when good looks were given out, but I don’t think some of them are too bad. 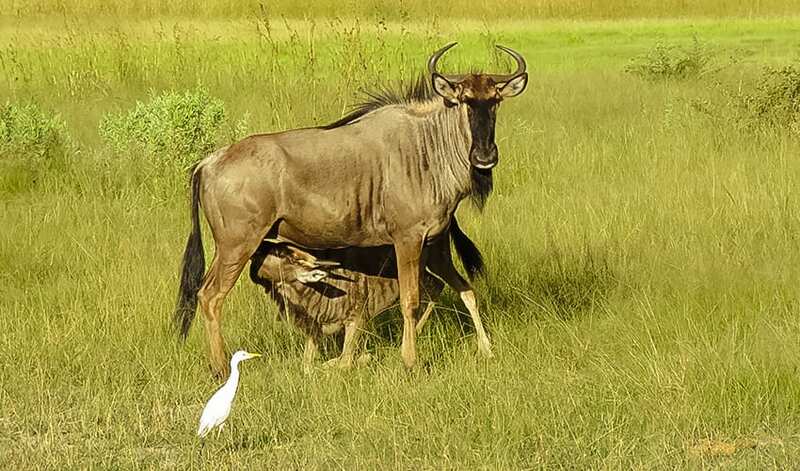 Take the wildebeest or gnu above, she looks so serene while her calf feeds. The warthog, aka the lovable Pumba from The Lion King, in real life is not that pretty with his stubby body and tusks! The other three are scavengers feeding on whatever is left from kills and I have to admit that they have faces that only their mother could love! Now, these guys by the very nature of their size are hard to spot. The Little Five include the antlion, the leopard tortoise, the elephant shrew, the rhino beetle and buffalo weaver. The antlion is not some weird cross between an insect and a mammal, but an insect about the size of an ant that is mainly found in sandy areas. In its larval stage, it looks more like a bug that digs into the sand to disguise itself before pouncing on its prey. As an adult, it is winged and similar to a damselfly. The buffalo weaver is probably the easiest to spot as it is quite a common bird. 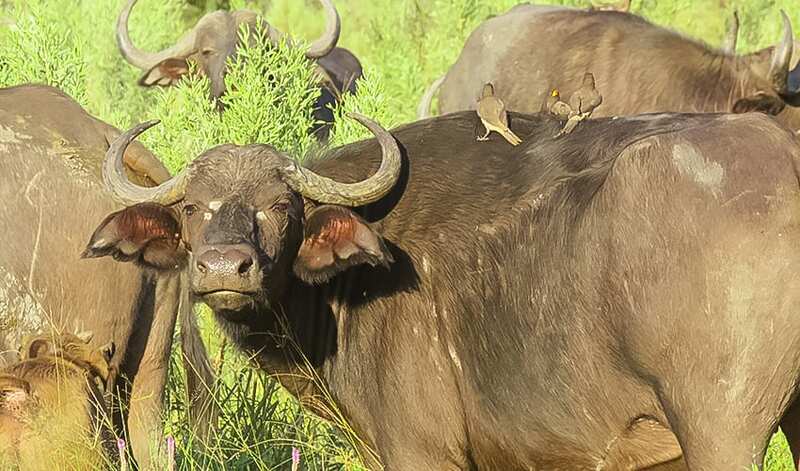 It is often seen in acacia trees or pecking on the bugs and insect on the buffalos’ backs. Rhino beetles are a large hard-shelled beetle with a single large horn on its head similar to a rhino. The horns are used by the males to fight each other. It is one of the largest beetles at around 6cm long. Apart from the adorable meerkats, all the members of the Shy Five are nocturnal. The aardvark, the porcupine, the striped hyena-like aardwolf and the cute looking bat-eared fox all come out at night, and although we saw a porcupine hustling down a track in front of us, he didn’t stop to have his photo taken. Apart from the porcupine, they are all insect eaters and devour termites, ants and other beetles and bugs with relish. The porcupines, however, have a vegetarian diet eating leaves, berries and are rather partial to bark and wood. Well as the name says, there are the most elusive and impossible five animals to see in Africa. We have the Aardvark, the Cape mountain leopard, the scaly ant-eating pangolin, the endangered riverine rabbit and the very rare white lion (in the wild). If you get to see any of these you are very lucky indeed!